Peters equal area projection, with continents which at the first glance seemed in such unfamiliar distorted shapes, has by now become one of the standard presentations of the world. 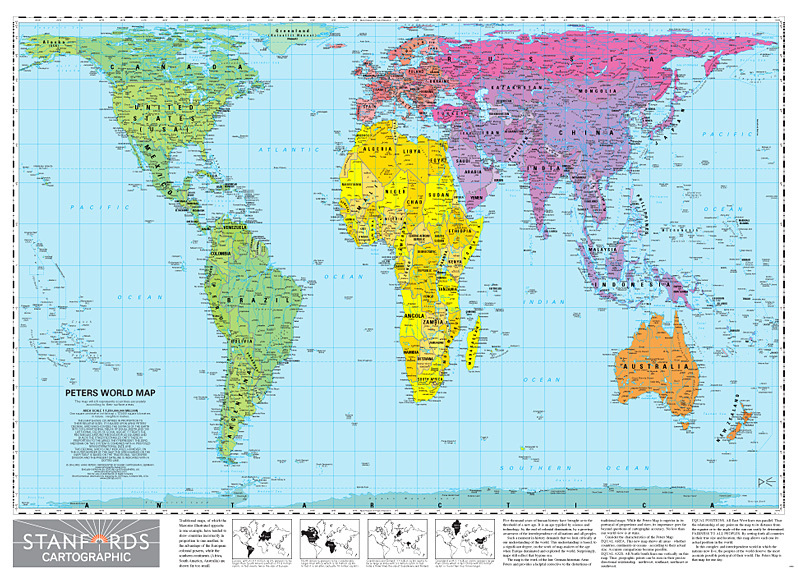 This political map, size 84 x 59cm (33" x 23" approx), using a projection invented by James Gall in the 19th century and popularised by Arno Peters in the 1970s, corrects the view of the world which most of us grow up with - the Mercator or a similar projection which makes the Northern Hemisphere appear far larger than it really is. In this Peters Projection ENCAPSULATED version, each continent and within it each country is drawn to present them in correct relative size to the rest of the world. All place names are in their English versions. Latitude and longitude lines are drawn at 10º intervals. Under the map are drawings and text explaining how and why the Peter Projection is more accurate. PLEASE NOTE: this map is also available on paper without the encapsulation. WE REGRET THAT DUE ITS COPYRIGHT THIS ITEM CANNOT BE SOLD TO CUSTOMERS IN NORTH AMERICA. 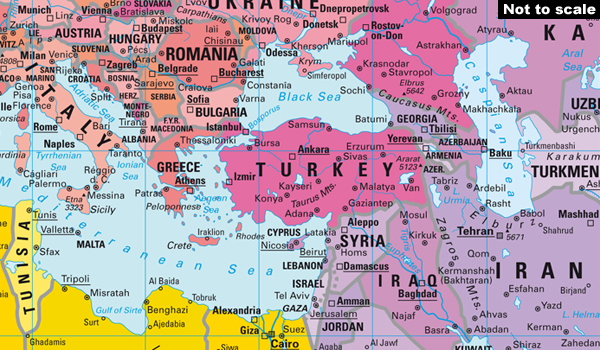 - LAMINATED wall maps have a thin layer of plastic usually applied to the printed side only. They can be written on with suitable marker pens without any damage to the map but, unless laminated on both sides, they are not damp-proof. - ENCAPSULATED wall maps are sealed between two sheets of plastic. They are more rigid and heavier than laminated maps of the same size. They are damp-proof and do not crinkle in humid conditions. Encapsulation gives the map a shiny surface, similar to being displayed behind glass. - PLEASE NOTE: many publishers and retailers often use these two terms interchangeably. Our map titles and descriptions follow the definitions provided above. Size: 84.5 x 59.5cm / 33" x 23.5" approx.